Recovers files deleted after pressing Shift+Delete on the keyboard. Recovers files deleted when Move or Cut command have been used. Recovers files deleted by other applications or by viruses. To recover deleted and lost data from hard drives, flash drives, USB drives, SD Cards, MMC, Firewire and Zip drives use Disk Doctor's Undelete. 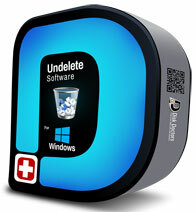 Disk Doctors Undelete features an extremely easy interface and powerful functions for quick recovery. Disk Doctors Undelete can recover data from both FAT and NTFS file systems. The unique disk scanning technology of the software can easily handle recovery tasks that other software cannot. It quickly locates and restores deleted files that other "undelete" software could never find. Saving recovered data in compressed (ZIP) format. Recovers files deleted after using Shift+Delete keys. Recovers files deleted by viruses.